The Linux Standard Base (LSB) is a joint project by several Linux distributions under the organizational structure of the Linux Foundation to standardize the software system structure, including the Filesystem Hierarchy Standard used in the Linux kernel. The LSB is based on the POSIX specification, the Single UNIX Specification (SUS), and several other open standards, but extends them in certain areas. The LSB specifies for example: standard libraries, a number of commands and utilities that extend the POSIX standard, the layout of the file system hierarchy, run levels, the printing system, including spoolers such as CUPS and tools like Foomatic, and several extensions to the X Window System. LSB also specifies boot facilities, such as $local_fs, $network, which are used to indicate service dependencies in System V-style initialization scripts. A machine readable comment block at the top of a script provides the information necessary to determine at which point of the initialization process the script should be invoked. It is called the LSB header. The command lsb_release -a is available in many systems to get the LSB version details, or can be made available by installing an appropriate package, for example the redhat-lsb package in Red-Hat-flavored distributions such as Fedora,  or the lsb-release package in Debian-based distributions. The LSB is designed to be binary-compatible and produce a stable application binary interface (ABI) for independent software vendors. To achieve backward compatibility, each subsequent version is purely additive. In other words, interfaces are only added, not removed. The LSB adopted an interface deprecation policy to give application developers enough time in case an interface is removed from the LSB. This allows the developer to rely on every interface in the LSB for a known time and also to plan for changes, without being surprised. Interfaces are only removed after having been marked "deprecated" for at least three major versions, or roughly eleven years. LSB 5.0 is the first major release that breaks backward compatibility with earlier versions. 1.0: Initial release June 29, 2001. 1.1: Released January 22, 2002. Added hardware-specific specifications (IA-32). 1.2: Released June 28, 2002. Added hardware-specific specifications (PowerPC 32-bit). Certification began July 2002. 1.3: Released December 17, 2002. Added hardware-specific specifications (Itanium, Enterprise System Architecture/390, z/Architecture). 2.0.1: Released October 21, 2004, ISO version of LSB 2.0, which included specification for all hardware architectures (except LSB-Graphics, of which only a generic version is available). 2.1: Released March 11, 2005. 3.1: Released October 31, 2005. This version has been submitted as ISO/IEC 23360. 3.2: Released January 28, 2008. This version has been submitted as ISO/IEC 23360. While the LSB is a standard and without a competitor, it is followed only by few Linux distributions. For instance, only 21 distribution releases (versions) are certified for LSB version 4.0, notably Red Flag Linux Desktop 6.0, Red Hat Enterprise Linux 6.0, SUSE Linux Enterprise 11, and Ubuntu 9.04 (jaunty); even fewer are certified for version 4.1. This choice of package format precludes the use of the many other, existing package formats not compatible with RPM. To address this, the standard does not dictate what package format the system must use for its own packages, merely that RPM must be supported to allow packages from third-party distributors to be installed on a conforming system. Debian has included optional support for the LSB early on, at version 1.1 in "woody" (3.0; July 19, 2002), 2.0 in "sarge" (3.1; June 6, 2005), 3.1 in "etch" (4.0; April 8, 2007), 3.2 in "lenny" (5.0; February 14, 2009) and 4.1 in "wheezy" (7; May 4, 2013). To use foreign LSB-compliant RPM packages, the end-user needs to use Debian's Alien program to transform them into the native package format and then install them. Debian strived to comply with the LSB, but with many limitations. However, this effort ceased around July 2015 due to lack of interest and workforce inside the project. In September 2015, the Debian project confirmed that while support for Filesystem Hierarchy Standard (FHS) would continue, support for LSB had been dropped. Ubuntu followed Debian in November 2015. Additionally, the compliance test suites have been criticized for being buggy and incomplete—most notably, in 2005 Ulrich Drepper criticized the LSB for poorly written tests which can cause incompatibility between LSB-certified distributions when some implement incorrect behavior to make buggy tests work, while others apply for and receive waivers from complying with the tests. He also denounced a lack of application testing, pointing out that testing only distributions can never solve the problem of applications relying on implementation-defined behavior. For the vendors considering LSB certifications in their portability efforts, the Linux Foundation sponsors a tool that analyzes and provides guidance on symbols and libraries that go beyond the LSB. ^ "Certifying an Application to the LSB". Linux Foundation. 2008. Archived from the original on July 15, 2009. Retrieved April 26, 2010. ^ "Facility Names". Linux Standard Base Core Specification 3.1. 2005. ^ "Package redhat-lsb". fedoraproject.org. Retrieved August 15, 2015. ^ "LSB Roadmap". Linux Foundation. 2008. Retrieved April 26, 2010. ^ "LSB 5.0 Release Notes". linuxfoundation.org. Archived from the original on July 8, 2017. Retrieved June 3, 2015. ^ djwm (March 10, 2011). "Java removed from Linux Standard Base 4.1". Archived from the original on December 7, 2013. ^ "Java removed from Linux Standard Base 4.1". h-online.com. March 10, 2011. Retrieved August 15, 2015. ^ "LSB 5.0 Release Notes: Qt 3 Removed". linuxfoundation.org. Retrieved June 3, 2015. ^ "ISO Publicly Available Standards". Retrieved October 15, 2011. ^ "Chapter 22. Software Installation 22.1. Introduction". Linux Standard Base Core Specification 3.1. 2005. ^ "Chapter 22. Software Installation 22.3. Package Script Restrictions". Linux Standard Base Core Specification 3.1. 2005. 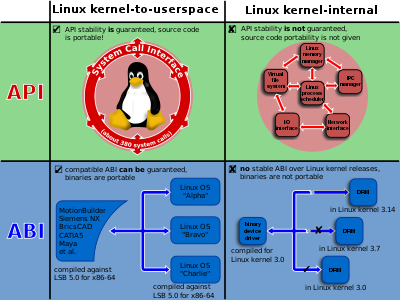 ^ a b "Debian -- Details of package lsb in lenny (stable) -- Linux Standard Base 3.2 support package". Debian Project. August 18, 2008. Retrieved April 26, 2010. ^ "Debian LSB". Debian Project. Retrieved April 26, 2010. ^ "Debian dropping the Linux Standard Base". lwn.net. ^ "lsb 9.20150917ubuntu1 source package in Ubuntu". ^ a b Drepper, Ulrich (September 17, 2005). "Do you still think the LSB has some value?". Retrieved April 26, 2010. ^ "All About the Linux Application Checker". Linux Foundation. 2008. Retrieved April 26, 2010.